The combination of variety and entertainment is hard to come by, but PubCrawls.com is going to give it to you when it you need it most. Rather than having to go through all of the work of organizing your own pub crawl, they've done all of the planning for you. There's nothing better than enjoying some great bar variety in a city like Houston, and it's only better when Cinco de Mayo rolls around. This year, get ready to enjoy your favorite Mexican-style drinks at your favorite Midtown Houston bars. Margarita's, Sangrias's, and of course, Tequila Shots! Mexican traditions for Cinco de Mayo are world famous and Houston is ready to welcome to festivities that we've been waiting for all winter long. The battle of Puebla may have ended over a century ago, but the celebrations get better and better every year. Featuring some of the best bars that Midtown Houston has to offer, you'll meet new friends and be able to hop around town with all of them. The registration process is quick and simple, retrieve your wristband and map, and you're ready for a drinking adventure that will mark this date on your calendar for the following year. It doesn't get much better than a night out with some great drink special variety. 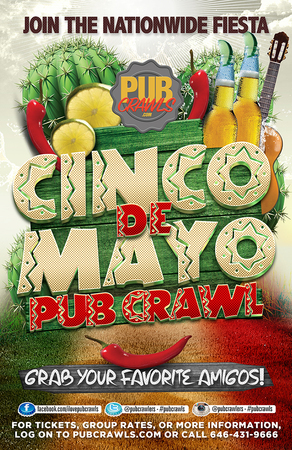 Take in the receptive atmosphere that this joyous holiday brings and ring in the beginning of May with the best tequila shots and beer specials in town.